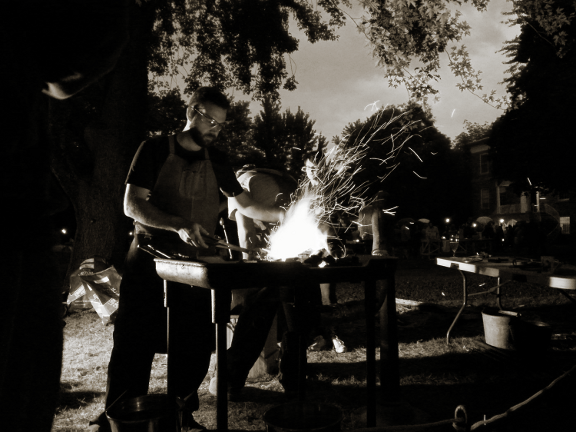 This is the personal blog of artist blacksmith Neil Blythin, based in Niagara Falls, Ontario. It is intended to document my journey, as I attempt to turn my love of tool making and blacksmithing into a new profession. Since first starting this website in 2011, a great many things have happened in life – things I could not have predicted when first starting out. As a result, my path to a new blacksmithing profession has taken a few twists and turns along the way. Some of these life events have been challenging, but they all add to a rich life experience. After several years of learning, and a few false starts, I am excited to finally be launching a new blacksmithing and tool making business in the winter of 2015-16. If you are new to the site, and wish to read about how my ‘adventures in blacksmithing’ began, please start with the blog post “Why Blacksmithing?”. Otherwise, please feel free to browse. The posts linked in the menu on the right of the screen are the most recent ones. If you would like information on my upcoming blacksmithing venture, please visit my new (business) site The Brookfield Forge.